Creation of the Libertad Battalion. A different version. Following the Allied landings on France’s Normandy coast in June 1944, the tide began to turn in the Second World War for the belligerent Germany which traded her militaristic expansionism for a gradual withdrawal on every battle-front. The advance of the Allied troops in northern France together with daring raids by groups of resisters in central and southwestern France forced the German army to retreat towards the borders of Germany, but small areas along the Atlantic coastline were not abandoned. 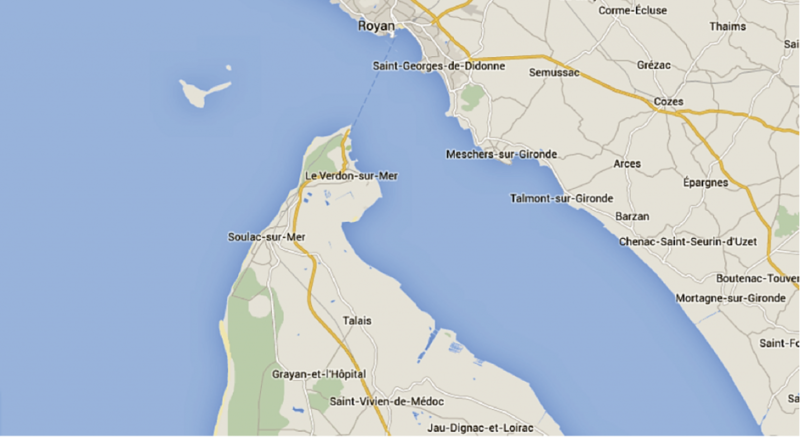 Such areas, lashed by chilly oceanic waters and besieged on the landward side by regular troops and partisan bands became fortified redoubts (in German festung) and remained in German hands up until a few weeks prior to the end of the war in Europe; examples of this included the Royan area or the La Rochelle submarine base, as well as islands like Oléron or Île de Ré, outstanding pockets of German resistance just short distances from the continental shores. From time to time a watch was mounted from such redoubts over certain strategic areas, capitalising upon the geological features of the French coast. One such instance was the Gironde estuary, made up of the confluence of two rivers – the Dordogne and the Garonne – downriver of Bordeaux, the capital of the Aquitaine region of France and seat of the prefecture of the Garonne department. During the summer of 1944, harried German troops fell back towards both banks of the estuary, occupying on the landward side an extensive fortified area (Festung Gironde Nord), centred on the town of Royan and were dug in on the opposite bank of the estuary (Pointe de Grave) on the Médoc peninsula (Festung Gironde Sud). Against a backdrop of vineyards and pine forests surrounded by marshes and beaches, with heavily armed areas along the coast (both the Atlantic coast and the shore lapped by the waters of the estuary), some 4,000 Wehrmacht (army) and Kriegsmarine (navy) personnel held out for months behind the solid defences of the Festung (Fortress) Gironde Sud. 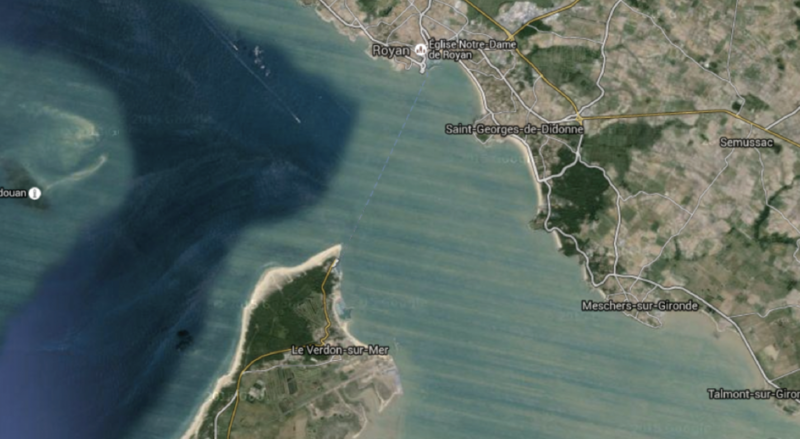 This strategic military position – defended by dozens of fortified locations – seriously concerned the French forces surrounded this enemy enclave, for it posed a threat to the important port area of Bordeaux which had but recently been liberated and it was a menace to the Allied supply lines. Worse still, the dearth of suitable ammunition and armaments, prevented an attack on the enemy positions (which were connected by trenches surrounded by barbed wire, mine-fields and anti-tank ditches). Moreover, the first air raids mounted by the Allies had failed to live up to expectations, for the sturdy, networked defences had survived the air raids which had claimed more civilian than German lives. 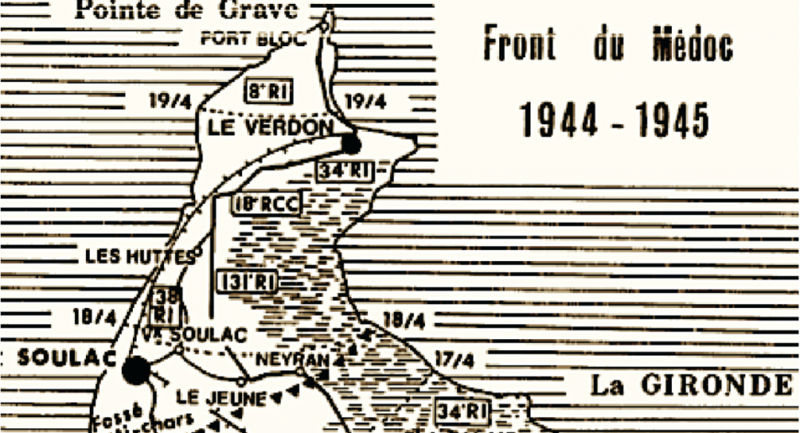 Only months later, in the spring of 1945, would the final push against the German garrison be unleashed: the so-called Battle of Pointe de Grave and liberation of the Médoc. In charge was Colonel Jean de Milleret’s ‘Carnot’ Brigade. Milleret (1908-1980) – alias Carnot – could this time call upon modern equipment together with a motley deployment of armour (antiquated battle cars) and some aged artillery pieces. His human resources consisted of a motley assembly of French and colonial troops along with volunteers – most of them former guerrillas – from other nationalities. Among the latter were a few hundred exiled anti-Francoists marshalled into two infantry battalions. The Gernika Battalion (led by Kepi Ordoki and under the auspices of the Basque government-in-exile) was made up of Spanish Basques of varying ideological persuasions, and the Libertad Battalion, under the command of Major Santos and made up chiefly of CNT (Confederación Nacional del Trabajo) members with experience of fighting in Spain and in the French resistance. These units remain virtually unknown – especially the libertarians – and the odd thing about them was that besides their guerrilla C.V., they had served in regular French forces in mainland Europe. Also, Santos’s group was one of the few military units made up chiefly of anarchists to have fought under military discipline in the Second World War and Ordoki’s team represents the only known instance of exclusively Basque recruits enlisted in the French army. PHOTOGRAPH: The Médoc peninsula. 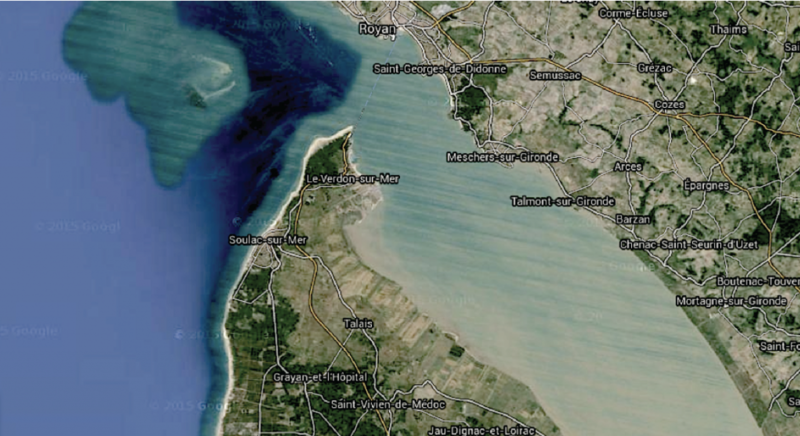 The Atlantic coast at Soulac-sur-mer (lower left), Verdon-sur-mer (centre right) and Pointe de Grave (top). Source: Google Maps. These were combat units wherein the combatants (bound together on the basis of cultural, linguistic or ideological affinities) freely chose their more immediate officers, but their freedom of action was not to be compared – given that they were subject to military discipline – with the autonomy typical of Resistance groups (be they French, Spanish or a blend of the two), in which many of the members had previously fought in a dispersed way. In addition, this situation was in stark contrast to the fighting structures – light on hierarchy – they had adopted during their early days as guerrilla units harrying the occupying army and collaborationist troops. The origins of this band of fighters are not to be traced to Bordeaux nor to the Gironde but to the French departments further south, where the maquisards (members of French guerrilla – maquis – units with a significant Spanish membership) were operating, as were anti-Francoist guerrilla groups (which were very active in south and southwest France). The Basque Brigade – later the Gernika Battalion – was being organized in southern France as part of the recently established (May 1944) Agrupación de Guerrilleros Españoles (AGE), an organization that aimed to rally all resisters of that nationality fighting on French soil. The AGE had ties to the Union Nacional Española/UNE (Spanish National Union), a political outfit set up and directed by the Communist Party of Spain (PCE) in France. The Agrupación’s guerrillas had stepped up their activities in the wake of the German retreat and the liberation of territory close to the Pyrenean frontier, using said territory as a base for operations looking towards a future invasion of Spain. Kepa Ordoki (1912-1993), from Irún, had served as an officer of the Basque Army during the Spanish Civil War and was a member of the ANV (Basque Nationalist Action) party, the only nationalist party to back the Popular Front in 1936); he was the organizer of the fighting unit recruited from among Basque veterans of the civil war in Spain fighting in groups sprinkled through the French maquis established in the Les Landes department and in the Pyrenean area. The guerrilla group would be brought up to strength by young men who had fled the repression in the Basque Country inside Spain. Albeit that the gudaris (Basque soldiers) brigade boasted a high percentage of members of the Basque Nationalist Party (PNV) and thus identified with the leaders of the Basque nationalist government-in-exile (which smile upon the formation of a specific military unit made up of personnel of Basque extraction), the running of the brigade had been driven by a communist leader, Vicente Vicuña (1913-2001) – alias Julio Oria – who was in charge of the Spanish guerrillas in the former French department of Bas Pyrenees and his priority was to train teams of Basque combatants familiar with the geography, culture and language of his homeland, with the aim of making them as autonomous as possible once they would infiltrate into it with an eye to mounting insurgent action targeting the Francoist forces of law and order. In the eyes of this native of Lasarte (Guipúzcoa) and other AGE leaders, the Basque Brigade was part and parcel of the guerrilla organization and operated in accordance with the politico-military strategy of the UNE. It would not take them long to realize that they were mistaken in this belief. The atypical history of this band of anarchist fighters (from their beginnings as a guerrilla group right up until they were turned into an infantry unit), their identities and the identity of their commander – who is named in some texts as Liberto and in others as Manuel – are shrouded in mystery, due to the dearth of trustworthy information. We have little to go by other than the information unearthed by the research carried out by historians into its sister unit, the Gernika Battalion, which was posted to the Bordeaux military district for reasons similar to those affecting the libertarian unit, and which also fought in the same sectors of the Medoc peninsula. In the case of the Basque unit, the fact that it was made up mostly of PNV nationalists has spurred on Basque researchers who have shown an interest in its story and publicized it. In addition, the abundance of accounts produced by its veterans prior to their demise – these days very few of the battalion’s members survive –contrasts with the lack of testimony from Libertad Battalion survivors. Map of France in 1940 under the Nazi Occupation. Two years later, Germany overran the collaborationist Free Zone. It comes from a survivor of the Stalinist purges unleashed within Spain in 1937, the journalist and activist Wilebaldo Solano Alonso (1916-2010) who sets out his own part in setting up the anarchist battalion which he insists he assisted thanks to the contacts he had maintained inside Eysses prison where he had been jailed up until French resistance personnel liberated him. 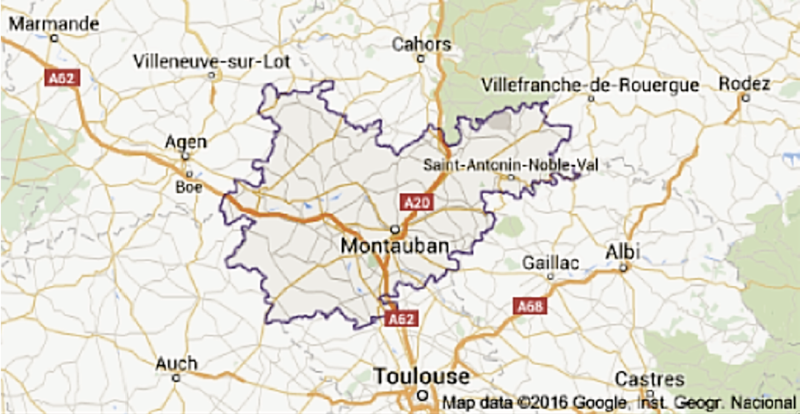 “Solano and I headed for Montauban, not far from Toulouse. To make a long story short, I can say that we were both arrested along with some others from the POUM. On 17 and 18 November 1941, about fifteen POUMists – Andrade, Solano – and I were hauled before the special section of the Court Martial charged … irony of ironies! … with communist activities. Posted later to another camp nearby, Iglesias Suárez would be liberated in April 1945 by a US army unit and sent back to France. But this investigation and collation effort is not concerned with the Nazi death camps, but with the story of two guerrilla units made up of anti-Francoist fighters who fought in one of the last battles of the Second World War. The first (foundation) stage of one of them – the Libertad Battalion – is connected to Eysses prison in France and to the town in which it is located, and so now for a short glimpse of the history of that sinister prison and of the maquisards who freed those dispatched there. Situated in the town of Villeneuve-sur-Lot (Lot-et-Garonne department), the main building of Eysses prison was originally a Gallo-Roman monastery and later a Benedictine abbey prior to the French Revolution. Its service as a prison began in 1803 when it was turned into a jail and, later, into a Monitored Education prison. 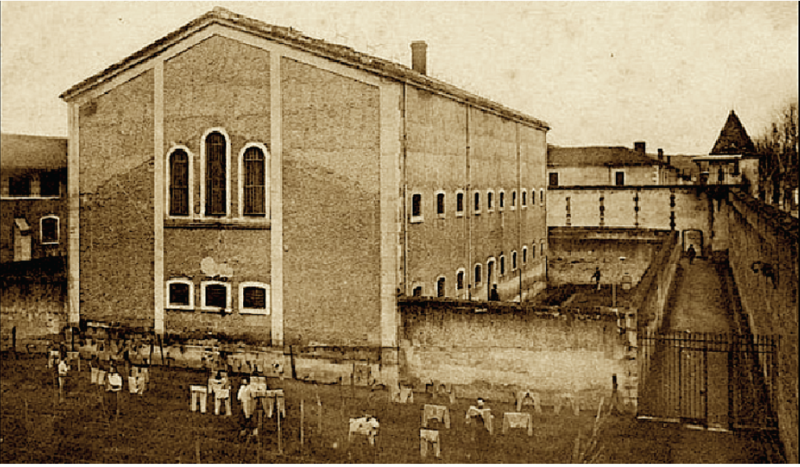 Photo – Eysses Central Prison (from a contemporary postcard). In the foreground stand the clothing stall-holders beside one of the prison buildings. In the 20th century, the Vichy regime pressed the old buildings of the Maison Centrale de Force back into service as a penitentiary. Under a decree from Marshal Pétain (1856-1951), from October 1943 the ancient closers welcomed lots of political prisoners who were posted there. The aim behind these transfers was to marshal together those deemed the most undesirable, thereby avoiding their being scattered through other centres with less strict supervision that was being established in the prison in Villeneuve-sur-Lot. And so the inmate population subject to the severe disciplinary regimen in Eysses climbed, between 1943 and 1944, to 1,200 dangerous political prisoners (besides a few hundred ordinary or remand prisoners). Although the close supervision was meant to minimize escape attempts, escapes did take place due to the exploitation of security shortcomings and negligence on the part of the guards. A toughening-up of life in the prison as a result of those escapes failed to stamp out escape bids which would culminate in the revolt orchestrated by Francois Bernard (1908-1944) – a former major with the 139th International Brigade in the battle of the Ebro (1938) during the Spanish Civil War – who had come up with a scheme to take over the installations of the prison. He was to lead the prison revolt. Photo: Eysses Central Prison. The building from the previous photograph, as it is today. On 19 February 1944, the plan was put into action, the prison governor seized (as was an inspector-general on a visit to the prison) and the warders penned in the yards. Unfortunately, German troops were alerted and they encircled the building and hunted down the inmates. After a three-hour siege and an ultimatum that the prison buildings would be razed by means of artillery fire if resistance did not cease, the rebels surrendered and handed over what few weapons they had. The repression was savage and indiscriminate. Inmates presenting with injuries sustained during the fighting were shot within the prison precincts (as wounds were a sure sign of their having been part of the uprising) and so were any turned in by the warders: in all, 12 prisoners were executed up against a wall in the yard occupied by the prisoners’ clothing stalls (see photo). 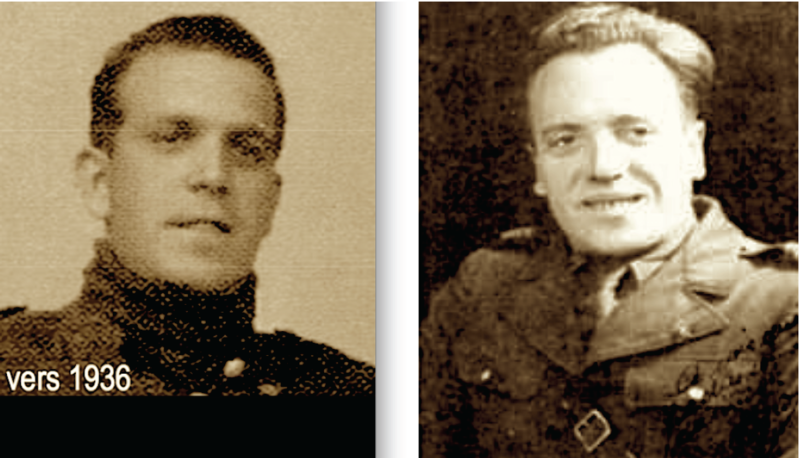 Among them was the leader of the revolt (François Bernard) and two members of the communist Unified Socialist Party of Catalonia (PSUC) who been part of the revolt (these were Jaime Serot and Beltrán Domenech Serveto). Three months after the revolt, the terrifying ‘Das Reich’ SS Division showed up in Eysses, punching and using rifle butts to get most of the inmates to line up before shipping them off in lorries to the railway halt in Pennes d’Agenais. In addition, a hundred inmates would arrive there on foot after a hellish 7-kilometer trek that would cost the life of another Spaniard, murdered before he could not keep up with the forced march pace required by his captors. For the Eysses inmates, arrival at the station in Penne d’Agenais brought to an end phase one of their deportation to the German death camps. Bundled and packed into railway wagons they were off on a journey that would carry them out of France. The notorious Dachau concentration camp was the end of the road for most of them. 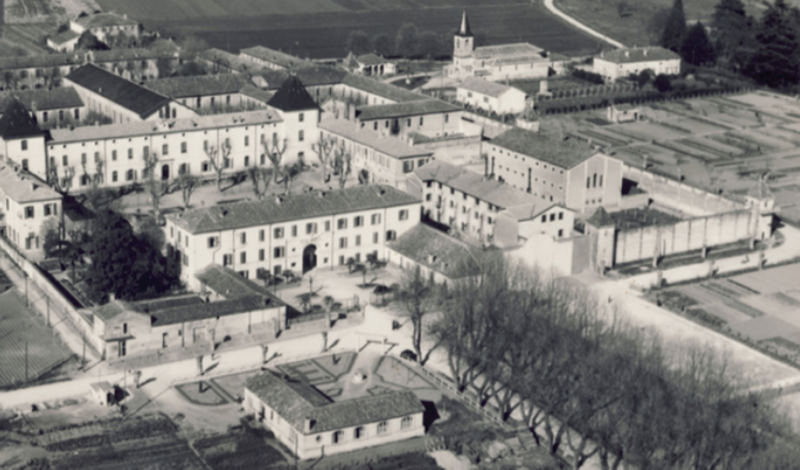 Following his release from Eysses prison in July 1944 by guerrillas from the North Lot No 1 (Secret Army, an amalgamation of several Gaullist French Resistance organizations), Solano took over the organizing of a Military Medical Agency for the Lot-et-Garonne fighters. This mission was assigned to him by the commander of the maquis that had liberated them, René Schleidweilr (1919-1955) alias Dollé. Expelled from his native Lorraine after it was annexed by the Third Reich when the war broke out and having fled to southwestern France, to the historical province of Périgord (split between the departments of the Dordogne and Lot-et-Garonne), it was in Thiviers (in the Dordogne) that René Dollé joined the resistance along with some friends from the area. Not that his activities would go undetected by the German authorities. Dodging capture, he moved to the Lot-et-Garonne and there, in Trentels (in the Villeneuve-sur-Lot district) he set up a maquis attached to the AS (Secret Army) and nick-named after him as the Dollé Company. Besides liberating the prisoners from Eysses, Dollé’s guerrilla group played an important part in sabotaging railway installations (mounted in order to bringing enemy traffic to a standstill) and carried out harrying operations against the Wehrmacht in concert with other armed Resistance groups: the Geoffroy Battalion (led by Jean Vermont) and the Kléber maquis. René Schleidweilr’s company numbered 135 guerrillas by June 1944 and that numbered continued to grow until September that year when the three fighting units named were amalgamated into a brand-new one, the Lot-et-Garonne Light Brigade which would be incorporated into the FFL (Free French Forces). This craving for “a different sort of organization and different politics” sprang from their rejection of the authoritarian practice the PCE clung to after the liberation of the south of France. The organizations it had raised in France – the UNE and the AGE – tried to silence the rest of the republican exile community – such as the anarchists and socialists – which refused to join them, generating a climate of mistrust that degenerated into threats and eruptions of violence. That climate of friction led to the establishment of the libertarian battalion, as Solano recounts. “The Libertad Battalion was set up at the beginning of the month of August 1944. I was still with the North Lot No 1 group, which a number of Spaniards had certainly joined. Besides, as I was taking part in meetings between the commanders of the various guerrilla groups and Resistance leaders (some of whom were pals from Eysses …) I was very au fait with what was going on in the region. This conferred upon me a measure of authority that was certainly useful. Reports were even reaching us regarding what was happening in the UNE guerrilla groups, the prevailing unhappiness and the reprisals taken by some leaders against their dissidents and members from other organizations bridling at the UNE’s policies. 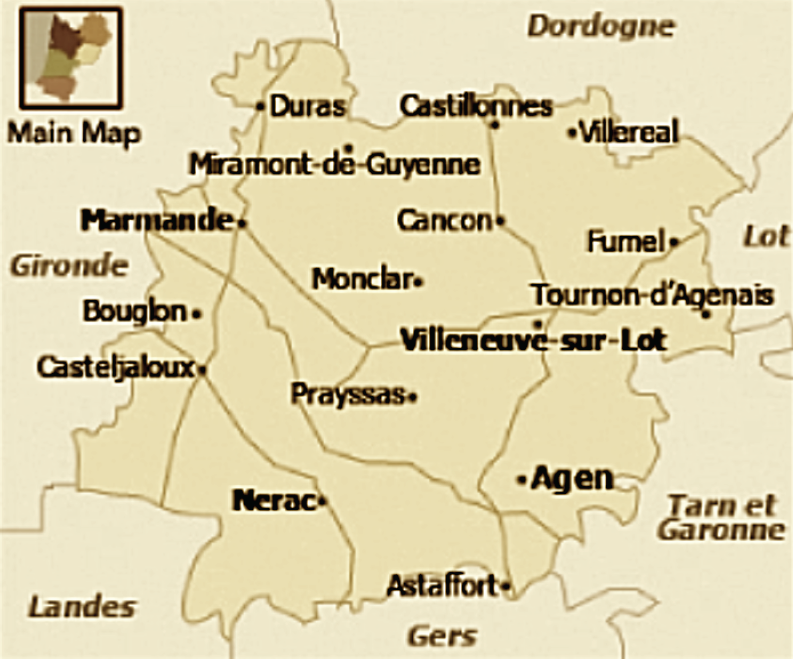 So, according to his evidence, the geographical area where the Libertad Battalion was raised was in the Lot-et-Garonne department, specifically in the town of Villeneuve-sur-Lot (where the Eysses Central Prison was located) and, to a lesser extent, in Fumel. He also indicates that the initial group of founders, made up mostly of anarchists and Trotskyists, was swollen by other resisters drawn from nearby departments. On that basis, we have been on the look-out for references to anarchist guerrillas migrating from UNE units to the newly created battalion in geographical areas close to that department, but the scattered presence of Spanish anarchists in the guerrilla campaign in France has made that a tremendously difficult task. 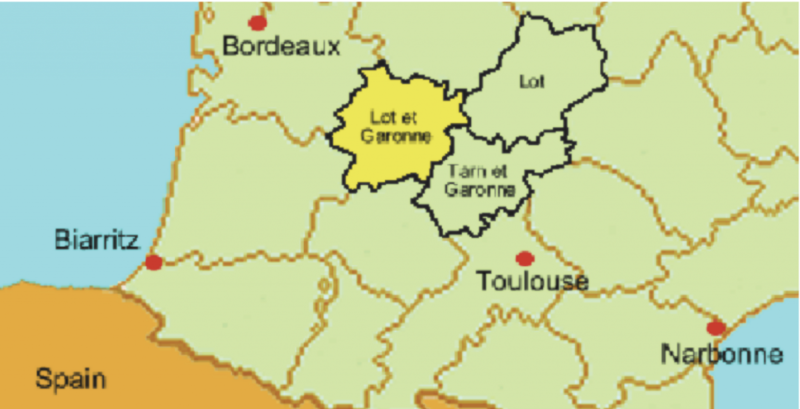 Map: The Lot-et-Garonne department at the centre of the map. Even so and in the knowledge that there can be no absolute certainty as to where the anarchist exiles who joined the Battalion came from, let us begin our search in the Lot-et-Garonne department and proceed through most of the adjacent departments. One of the latter was Les Landes – which is up next in our investigation – and there we think there is a greater likelihood of finding instance of guerrillas enlisted in other groups who may have quit these or sought transfers in order to join Major Santos’s group, because in France there were lots of libertarians “serving in the maquis in the south of France, in FFI, FTP and MUR groups or in autonomous units” where “by the hundreds, they carried on, on French soil. the struggle they had been waging against Spanish fascism”, as E. Sarboni insists in the book 1944:Les Dossiers noirs d’une certaine résistance. Regrettably, we have unearthed little else about this: just one picture (above) to illustrate it. The original caption reads: “Maquis in Tonneins” and it showed members of the Libertad Battalion. It comes from the family album of a fighter from the battalion who perished in the Medoc offensive which we shall be referring to throughout the pages which follow. Located between Villeneuve-sur-Lot and Cahors and the banks of the Lot, Thèze and Lémance rivers, Fumel sits on the border of the Lot department. There are chalk deposits there along with important quantities of iron ore – essential for foundries – covering a radius of 20 kilometers around the town. Profitable open-cast mining and the strong demand for smelted goods (for the construction of the railway lines that spread across France from the mid-19th century onwards) led to the foundation in 1847 of the Périgord Mining and Metalworking Company (SMMP) which would give an additional boost to industry in the region which already had a metal-working tradition dating back to the 15th century. During the first few decades of its existence, the SMMP required the services of a massive number of workers toiling endless hours. Not until 1910 did the workforce achieve a working day of three 8-hour shifts, albeit that this entitlement was suspended during the First World War (1914-1918) when, in order to meet the demands of war, the shifts were extended to 10 hours. At that point the factory’s specialty was churning out shells made by the huge numbers of female operatives hired to make up for the shortage of man-power (the men having been called up and shipped off to the front lines). Following Franco’s victory in Spain and the losers’ exodus into France, the latter – Spanish republicans – were forcibly recruited for Fumel’s industry during the world war that followed and they were compelled to participate in the war effort when deployed as replacements for French workers dispatched yet again to the front lines. It is estimated that by January 1940, 400 out of a total staff of 1,400 were anti-Francoist exiles, many of them drawn from the internment camps (Camp Lalande and Camp Judes) in Septfonds, a town in the Tarn-et-Garonne department, in the graveyard of which the remains of 81 Spaniards who perished as inmates were laid. In May 1941, the authorities drew from among the metalwork staff a Foreign Labour Team (GTE No 505), a year after the Vichy government set up such units with a mind to their bringing foreign civilians – mostly Spanish refugees – under military discipline for use as compulsory labourers. Such teams were, on quite a few occasions, the kernels of the maquis which sprouted across collaborationist France. Later, the imposition of Obligatory Labour Service (STO) upon French workers led to their flooding into the plants in Fumel. 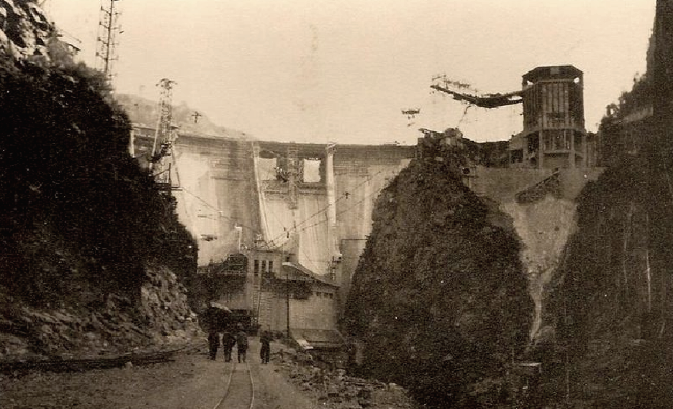 This came just as the production areas were being modernized (the workshops were expanded and a hydro-electric dam built), so the demand for man-power allowed these newly arrived workers to stay in the area and to dodge the unpopular STO which required that they serve outside of France. One year ahead of the STO’s coming into effect, the Fumel GTE already had a resistance network, made up of Spaniards. Its committee included leaders of the political parties in exile (one from the PSOE and one from the PCE), plus a representative of the CNT, as the anarcho-syndicalists were firmly ensconced in the metalworking workforce and its membership included militants of some renown who carried on with their efforts as exiles in France even after the German defeat. 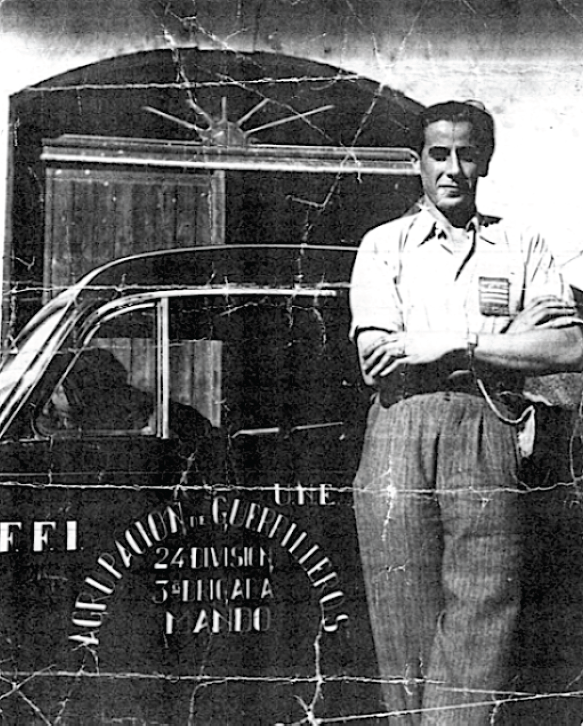 We have found some information about one of them which offers some brief biographical notes on CNT member Julian José María Floristán Urrecho (1905-1997), who held the post of CNT general secretary in the town of Fumel in 1945. “Come the outbreak of the Revolution in July, he made his way swiftly to Torre and Gandesa and had a hand in snuffing out the fascist rising in Villalba de los Arcos. Later, he joined the column raised in Tarragona to liberate Aragon. Again that July, he was to join the Cardod-Ferrer Column before going on to serve as general secretary for the collectives in 19 villages in the Valle-de-robles area. Come the raids on the collectives by Enrique Lister’s Stalinists, he was forced to go into hiding until he could reach Lécera where he joined the 117th Confederal Brigade, serving in its quarter-master section; later he served in the Remiro Battalion. On 9 February 1939 he crossed into France … and sampled the internment camps in Mauz, Le Vernet and Septfonds … and finished up in the foreign labour companies, deserting from one of them and making for the Pyrenees, ending up in Fumel. 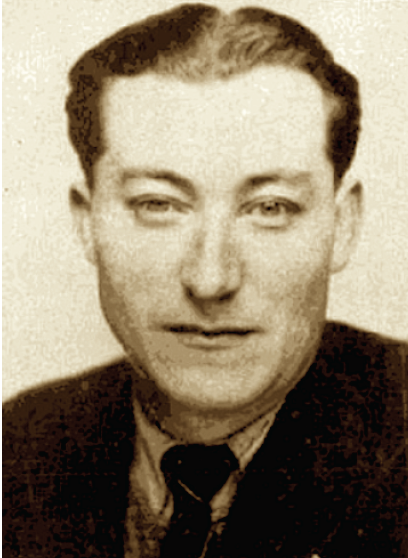 During his time in France he was active in the CNT, taking part in a range of organizational activities; he was present at the Paris congress in 1945 and at various plenums in the Toulouse area; he was general secretary of the Fumel CNT between 1945 and 1947 … of International Antifascist Solidarity (SIA) … and of Royan from 1954. He died in Royan in 1997. There is no denying that the reorganization of the CNT in Fumel – of which Floristán was one of the architects – was the result of the efforts of an active group of anarcho-syndicalists set up in the metalworking plant, one of the meetings of which had been attended by Solano and Santos shortly after the launch of the libertarian battalion in mid-1945. It was from that initial anarchist contingent that the anarchist commander was to recruit some of its members, albeit that we cannot say how many, as Solano mentions no numbers when he refers to some of the places from where these brand-new combatants were drawn. 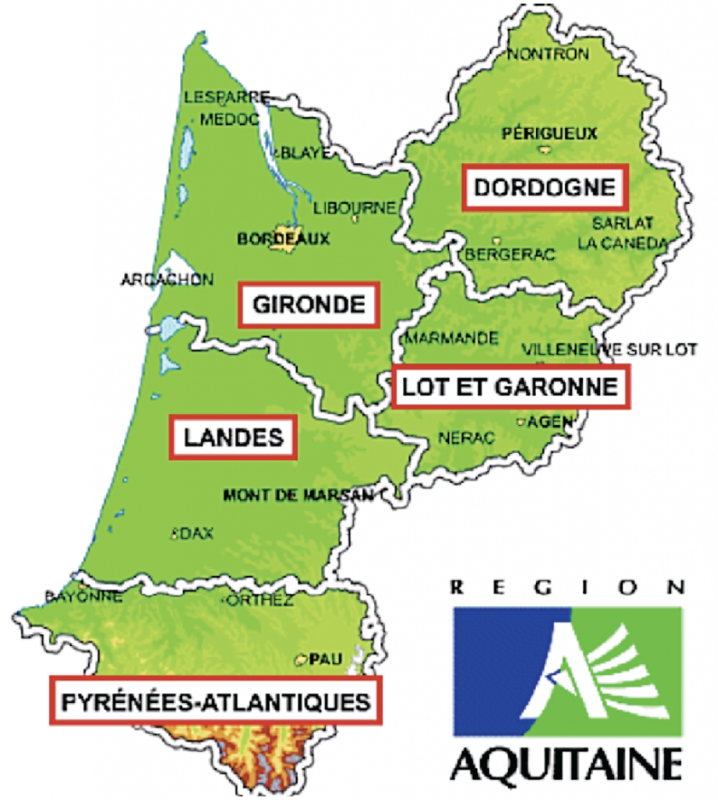 Nor does the Trotskyist journalist (Solano) mention Les Landes, a department on the Atlantic coast and located southwest of Lot-et-Garonne, as being the derivation of Spanish resisters who joined the Libertad Battalion. However, on the Foro de Historia Militar del Gran Capitan website, there is a mention of there having been libertarian fighters in that area who were unhappy with the pro-communist fighting unit in which they had been serving, the 31st Brigade of the AGE’s 24th Division and of their having left it, annoyed by the PCE’s undue influence within it. The AGE’s 24th Division was raised by the Almerian-by-birth and Melillan-by-adoption José Barón Carreño (1918-1944) – alias comandante Robert – formerly political commissar with the 31st Army Division of the Republican Army during the Civil War in Spain. While in exile in France he joined the 20th Brigade of the XIV Spanish Guerrilla Corps in Charente-Maritime and was in charge of training teams of Spanish guerrillas which had popped up at the prospect of the anticipated invasion of France by the Allies. At the beginning of 1944 he was appointed “to reorganize the Spanish armed groups in the southwest, boosting the creation of a large region-wide unit, the 24th Division of the Agrupación des Guerrilleros Españoles (AGE)” – as the blog http:www.historiaenlamemoria.blogspot.com.es informs us when it speaks of this Unified Socialist Youth (JSU) member. In August 1944, its promoter, Barón Carreño, was made commander-in-chief of the Spanish guerrilla agrupaciones in the Paris area. The capital of the Seine department was to be the young resister’s final posting as he was to be mortally wounded in a clash with Gestapo personnel during the fighting on the occasion of the Liberation, just a few days prior to the arrival of the General Leclerc’s 2nd Armoured Division (made up mostly of Spanish republicans) of the Free French Forces (FFL). The 24th Division was under the command of Mateo Blázquez Rodríguez (1919-2011) aka comandante Marta. This Madrid-born veteran of the fighting in Guadarrama and Somosierra during the Spanish Civil War endured the same via dolorosa as most of his exiled contemporaries, passing through French prison camps before ending us as a conscript labourer in a forestry plantation in Les Landes. In April 1943 he went to ground and was one of the founders of the maquis in La Torgue (Lot-et-Garonne). His CV included propaganda, sabotage and weapons retrieval activities; he also laid the groundwork for a prisoner break-out from Eysses, feeding weapons in from the outside. Later, his unit relocated to the Gironde to take part in the drive against German troops occupying Bordeaux. In August 1944, Mateo Blázquez Rodríguez was made captain of the FFI – French Forces of the Interior – taking part, with his unit, in the liberation of the Les Landes, Gironde and Charente departments. In March 1945 he was discharged from the French army. This group, part of the afore-mentioned 24th Division, operated in Montendre (Charente-Maritime department) before being posted later to Les Landes before finishing up in Bordeaux. It was under the command of another native of Madrid, Comandante Eduardo Casado – aka Barbas – formerly commissar with one of the brigades (the 10th) of the XIV Corps of Spanish Guerrillas commanded by Victorio Vicuña aka Julio Oria. The group’s liaison with the resisters in nearby Bordeaux (Gironde) was handled by a Spanish woman – Pilar, aka La Piluca – who had served as an officer in the Spanish Republican Army. Little is known of her background, but the same cannot be said of the activities she carried out as part of her clandestine fight against the troops of the Third Reich, for these were characterized by a sangfroid displayed in episodes such as when she freed and hid two soviet prisoners and an American aviator before the Germans – pulling out of Bordeaux – could execute them. After the liberation of France, she crossed the border to join the anti-Franco resistance, only to be captured and tortured to death. Her final resting place is not known. Following its relocation to Les Landes in 1944, the 31st Brigade had distinguished itself by seizing control of the highway and rail links between Bayonne and Bordeaux, preventing the arrival of reinforcements for the German garrison in Bordeaux. Renumbered as the 3rd Brigade (some sources speak of 3rd bis), the unit was one of four brigades that made up the 24th FFI-UNE Guerrillas Division under the command of comandante Marta and it took part in the fight for control of the Bordeaux district, helping the FFI fighting to liberate the area. The agrupación’s guerrillas protected the Pont de Pierre across the Garonne river (which passes through the city) so that maquis coming from the north could cross it. That bridge (erected between 1810 and 1822) turned into a strategic means of access to the area, being the only road connection between both banks during the years of the Occupation. It was there that there occurred a dramatic episode that has been etched into the collective memory: the death on 27 August of the guerrilla Pablo Sánchez, when, bare-chested, he rushed the enemy position defending the bridge and was mowed down by the automatic weapons installed there. That version of events, more legend than fact, prompted the massive turn-out for his funeral in the tribute paid him by the city of Bordeaux a few days later. However, a surviving friend and eye-witness to Sánchez’s death – Ángel Villar de Tejón (b. 1922), leader of the Spanish resisters in the Bordeaux submarine base, offers a different version of what occurred. This resister says that his death occurred during the clearance of mines from the bridge, which it was thought had been abandoned by the Germans as they fell back to Bordeaux and started out on their march to the northernmost point on the Medoc peninsula. After a sweep in which Villar was involved, a small team of guerrillas of whom Sánchez was one started removing the explosives. Carried away by his enthusiasm after he has successfully cut the wiring connecting the explosives, Sánchez had walked across the bridge with his hands in the air shouting “We’ve won, we’ve won!”, only to be cut down by machine-gun fire. A German sniper had opened fire. A plaque placed on the bridge recalls the Spanish guerrilla’s sacrifice. The presence of CNT members in this UNE brigade is borne out by the presence there of José Manuel Montorio Gonzalvo aka Chaval (1921-2009), albeit that this particular CNT member abided by the guidelines issued by the PCE and went on to lead a communist unit in Spain after the war – part of the Levante-Aragon Guerrilla Agrupación (AGLA) – in the Requena and Confrentes area from 1945 to 1952. Like thousands of his compatriots, he had been interned in concentration camps (Saint Cyprien, Barcarès and Argelès-sur-Mer) at the beginning of his exile in France and later shuttled around several towns as a conscript labourer. Captured by German troops in 1941 – and swapped by the Vichy government on the basis of three Spaniards equalling one French POW – he managed to break out of the Saint Médard-en-Jalles camp (which held workers employed on the building of a submarine base on the Gironde river at Bordeaux), he joined the French resistance the following year after a number of ups and downs. Montorio/Chaval is one instance of CNT guerrillas serving in communist units, albeit that he is not representative in that his subsequent political affiliations were not very commonplace, since he applied in 1948 to be admitted to the Communist Party of Spain (PCE). He was issued with a party card, even though this did not mean that he was giving up his membership of the anarcho-syndicalist confederation, since he regarded himself as a PCE member who just happened to belong to the CNT union. In 1945 he was the delegate sent by the brigade’s CNT members to the first congress of Spanish Guerrillas held in Toulouse. That same year, he attended two combat training schools before crossing the Pyrenees with another five Aragonese to make up a small guerrilla team from the Levante-Aragon Guerrilla Agrupación (AGLA) which would later go on to earn some notoriety as the Los Maños group. He would carry on with the fight in the mountains for seven long years, until, in June 1952 he received the order to fall back to France, which he did the very next month, when the guerrillas crossed the border into France. In 1955 he settled in Prague (Czechoslavakia) which he made his home and where he met his partner, Trinidad Sardina Merino, who died in 2002. “At the time of the Normandy landings by the Allied forces in June 1944, the 31st Brigade’s mission was to disrupt the Bayonne-Bordeaux railway line. We blew up to high-tension pylons and set fire to a goods train in Morcenx station (Les Landes). During the Liberation of France, a column of Germans was headed towards Bordeaux and their passage had to be blocked lest they enter the city. 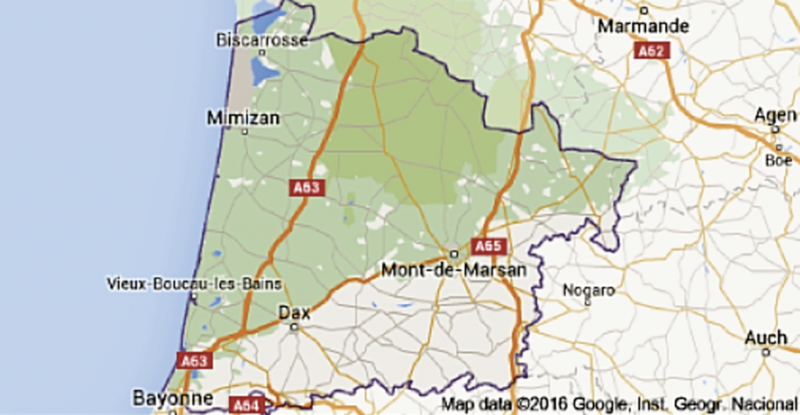 There was a clash with the Germans near Pissos (Les Landes). We sustained 9 losses: 4 dead and 5 wounded. But we managed to put the column off course and it was unable to get to Bordeaux. We mounted a checkpoint on the Bayonne-Bordeaux highway. 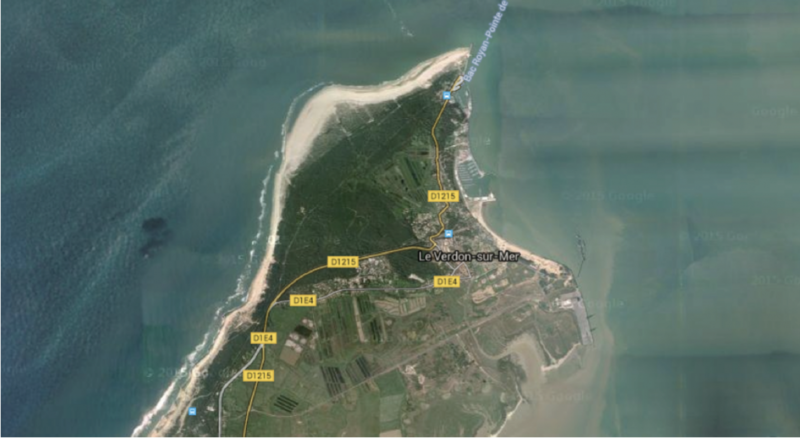 The liberation of Bordeaux was carried out with hardly a shot fired: the Nazi troops retreated via the Médoc road towards Pointe de Grave at the mouth of the Gironde river. As we can see, after Bordeaux had fallen to the resistance, the unit was posted to the Pointe de Grave front (where the Libertad and Gernika battalions took part in the last of the fighting in April 1945) but it was not there at the same time as the Basques and the anarchists, since the communist agrupación left that area in November of 1944. On the web we have found two references relating to Eduardo Casado Barbas’s brigade and the Libertad Battalion: both can be found on the Foro de Historia Militar el Gran Capitan, cited at the opening to this chapter. The first can be found on-line under Unidades españoles en el Ejercito frances: Libertad-Gernika. 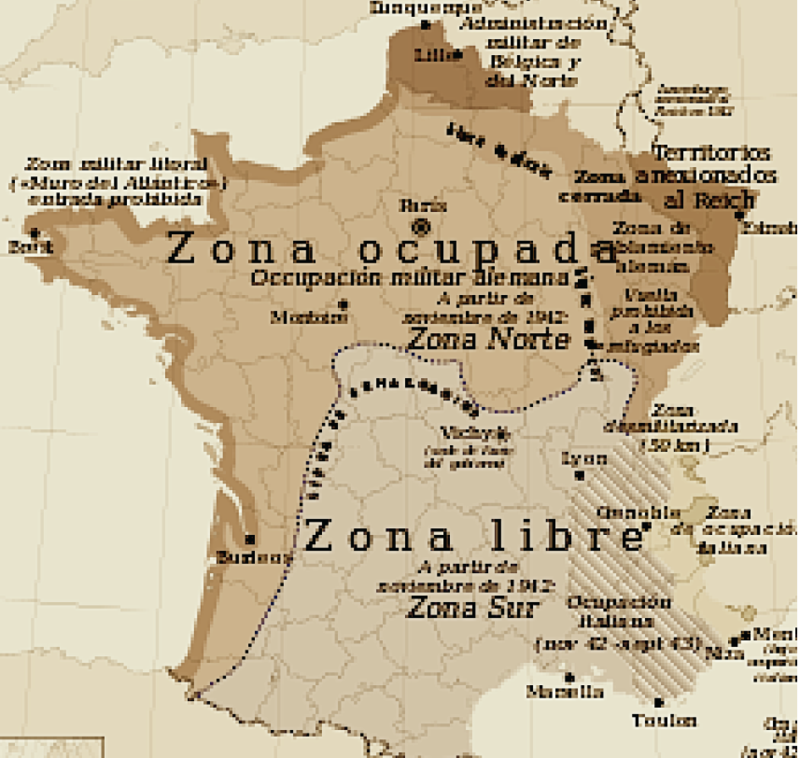 After the liberation of the city, the 31st Spanish Guerrilla Brigade went on to be absorbed into the FFI, French Forces of the Interior, as part of the VIII Military Region under the command of commandant Carnot. And stayed there, laying siege to Pointe de Grave until November 1944. PHOTO: August 1944. 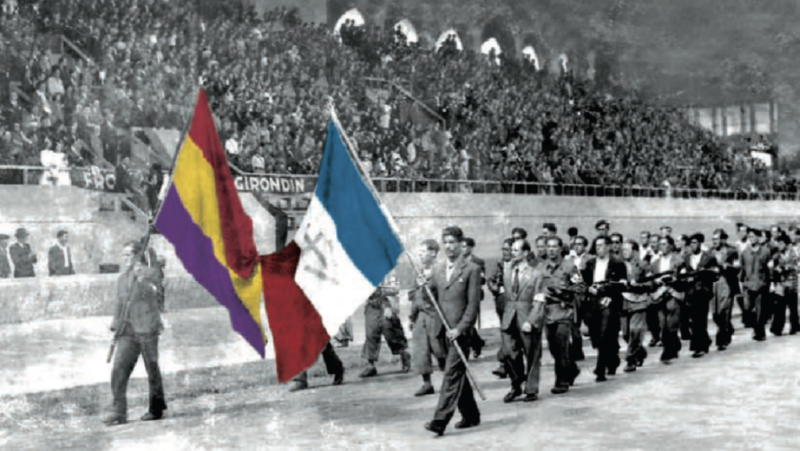 The (French and Spanish republican) colours lead the parade of the 3rd Brigade in the Bordeaux municipal stadium (Lescure Park) following the city’s Liberation. Map: A tourist map of the Aquitaine region, showing the departments from which the Spanish anarchist resisters who banded together to form the Libertad Battalion may well have come. Continuing through the departments adjacent to Lot-et-Garonne, to the north we come to the Dordogne and there only in the Belvès area have we found one person cited by name. This was the anarchist José Cervera who served in a maquis in the area before joining the Libertad, albeit that these are the only details cited by Ferrán Sánchez Agustí in El Maquis anarquista De Toulouse a Barcelona por los Pirineos. However, we have found some more generic information about the anarchist battalion in another interesting written source. 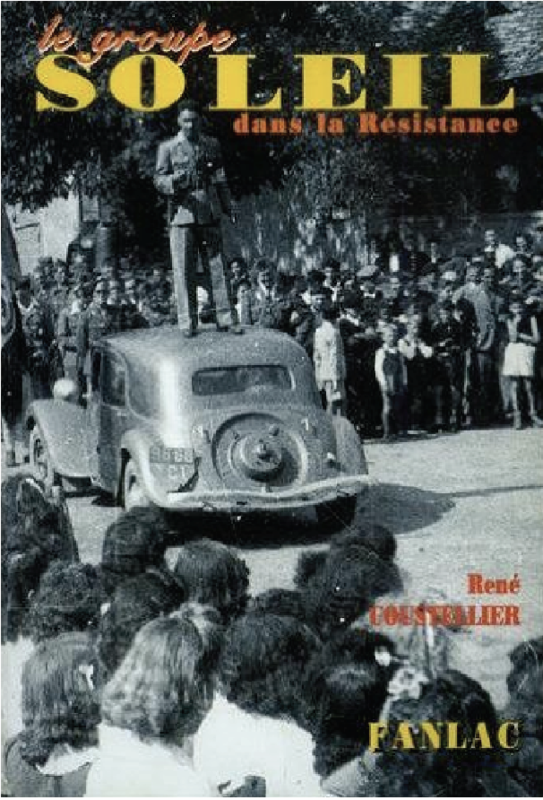 We mean the research of Fernando Martínez de Baños as set out in Hasta la total aniquilación, an intriguing book recounting the events of Operation Reconquista, the failed invasion of Spain across the Pyrenees by large contingents of anti-Francoist guerrillas in October 1944. There, in addition to providing us with information about the squabbles between the communist leaders during the gestation of the offensive, he describes the military resources on both sides and reports on the training of Spanish maquisards on French soil. Map: The Dordogne department in the centre. Contrary to what the author of Hasta la aniquilación argues, it does not look as if the Carlos and Soleil groups were actually the same unit under two different names, as there is plenty of information about the Soleil Group as a distinct maquis unit. Newspaper articles, interviews and even a book of memoirs written by the guerrillas’ commander, René Coustellier (b. 1920) – aka Soleil – deal with that unit which was established in the southern Dordogne in October 1943 on the basis of another guerrilla unit, the Groupe Franc No 1. In January the following year, that group became the FPTF (French Irregulars and Partisans, commonly referred to as the FTP, an armed resistance movement created by the French Communist Party in late 1941 to fight the Vichy regime and the Third Reich’s occupation forces). Coustellier rose through the ranks until he came to command the 4th FT Regiment. Adept in sabotage and high-risk operations harrying the German troops, the guerrilla group named after its charismatic leader’s nom de guerre earned a reputation as heroic and effective fighters. But in its early days this French maquis had an unusual feature that made it competition for other nearby resistance organizations. Friction sprang from the alternative approach that its commander, Soleil, adopted towards supplying it. His group not being acknowledged (adopted) by the Allies, it had been denied parachute drops of the sort dropped over out of the way locations by British aircraft and meant for the guerrilla units. Weapons, munitions and sundry equipment this sustained the resisters in their tense confrontation with the occupation forces. Picture: The cover of René Cousteiller’s book. The guerrilla commander atop the roof of a car. The rejection of their application for vital supplies did not daunt Coustellier’s men, who opted to get to the drops meant for other maquis first and looted them. That practice eventually became their speciality and – over the operational life of the group – amounted to 87 tons of gear pilfered. 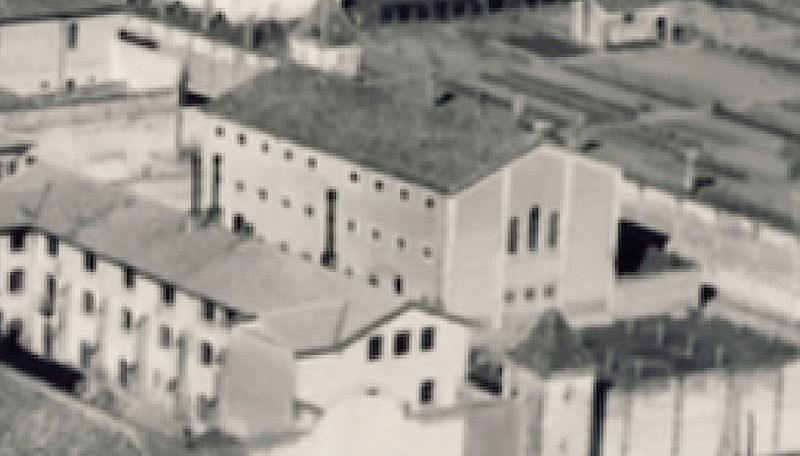 The geographical area where the Soleil group operated was in Belvès where it set up its operations base, although it did occasionally relocate to Grives. And its theatre of operations was not confined to the Dordogne as it also mounted operations in adjacent departments as well, including Lot-et-Garonne, where it was active in Villeneuve-sur-Lot in June 1944 (in the same location and on the same dates as René Dollé’s guerrilla group liberated Eysses prison) and in Fumel where – as we know – there was a strong anarcho-syndicalist presence in the metalworking plant there. Wilebaldo Solano refers to the Spaniards at the plant entering comandante Santos’s battalion and also mentions the revival in anarcho-syndicalist organizing in the area once it had been freed from the German yoke. According to his account, at that point members of the libertarian battalion were already in touch with the resurgent anarcho-syndicalist organization. What we do not know is whether there was liaison between those CNT members and the membership of the Soleil group during any of the incursions that Rene Coustellier made into Fumel. However, there is an instance of a French resistance group’s recruiting a Spaniard – Isaac Casares aka Tony (b. 1921), a native of San Sebastián who at the age of 15 had served as a volunteer in the Azaña Battalion (an Izquierda Republicana unit) during the Spanish Civil War. When Franco was victorious, Casares crossed the border into France and was interned in the Argelès prison camp. He would later be posted to Fumel, joining the resistance and entering – as we stated – the Soleil group in the ranks of which he helped liberate Périgueux, Angoulême, Bordeaux and La Rochelle. As to the second maquis group – the CARLOS GROUP – to which Martínez de Baños refers, it is possible that its connection with commander Soleil’s group may be the reason why they are sometimes confused or described as if they were one and the same group or a mixed unit. Contact between the two groups came about when René Coustellier organized training for would-be resisters at a Cadre School in Sauveterre (on a property made available by a crippled First World War veteran), a location easily evacuated in the event of danger in that it was located at the intersection of three departments (Lot-et-Garonne, Dordogne and Lot). 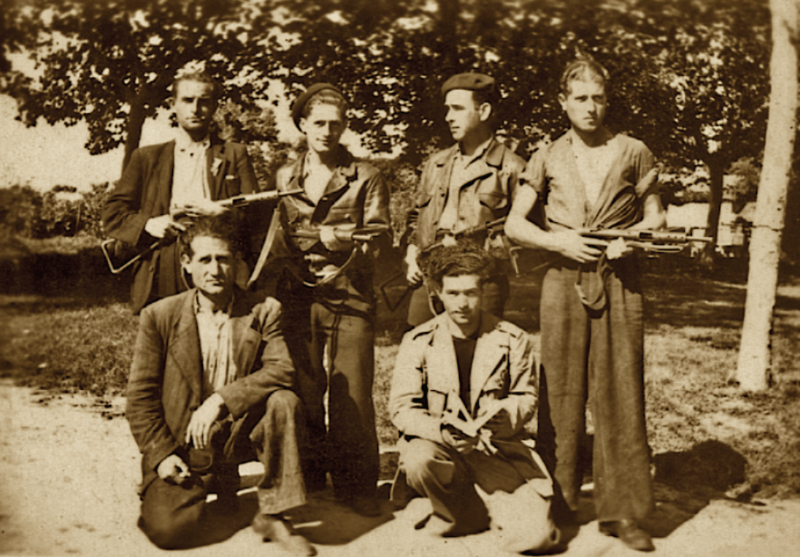 On that chosen ground teams of fighters were trained by staff with the experience and expertise to train French greenhorns joining the resistance; Spanish Civil War veterans who had signed on with the Carlos maquis, serving in a unit made of Spanish exiles under the aegis of the communist FPT-MOI. Foreign Man-Power (MOI), a trade union and political set-up linked to the French Communist Party-sponsored FTP was launched by the party in October 1926 in order to welcome, by nationality, groups of foreign workers helping to rebuild France after World War One. During the Second World War it would become the MOI (Immigrant, or International Man-Power), a combatant group that amalgamated with the FTP to create the FTP-MOI (MOI Irregulars and Partisans), a maquis on a small scale – no more than 30 men – which ensured that they were highly mobile. Its tactics differed from those followed by the Gaullist groups which followed a policy of continual harassment of the enemy, whereas the FTP-MOI chose to await the Allied troop landings (D-Day) before springing into action. 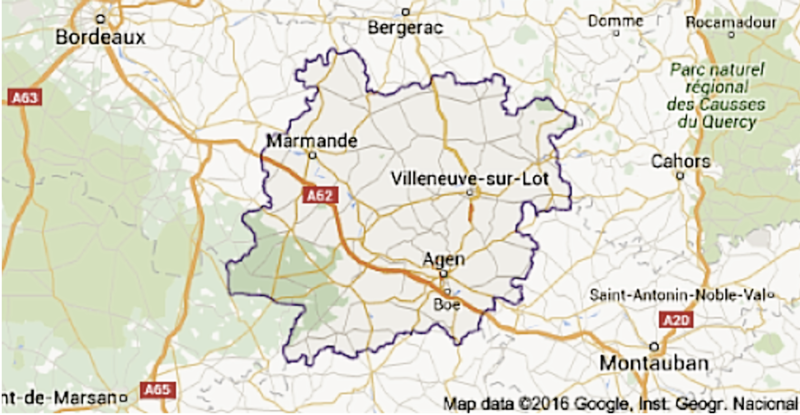 For their part, the three major French Resistance organizations in the southern zone (i.e. Combat, Libération-Sud and the Francs-Tireurs) joined together in 1942 as the Secret Army (AS) and in January 1943 their respective structures launched the United Resistance Movements (MUR) under the leadership of Charles De Gaulle. Finally, in 1944 they amalgamated with the FTP and also joined the newly-formed Resistance Army Organization (ORA). This amalgamation was named the FFI (French Forces of the Interior) and were placed under the command of Pierre Koening. Against this backdrop, the Carlos group was one of the FTP-MOI groups set up in Périgord Noir (in southeast France) and it was led by Carlos Enrique Ordeig Fontanall (b. 1913), aka Carlos. A native of Mataró, Ordeig had studied at the War School in Barcelona, graduating as an infantry lieutenant. During the civil war he had been assigned to a machine-gun battalion, serving as its captain on the Aragon front. Following the defeat of the Republic and a period of internment in France, he was posted to the shipyard in Pamiers where he made contact with leaders of the resistance in the summer of 1942. 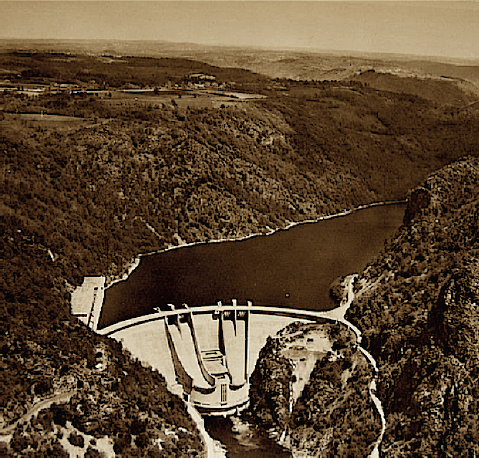 In a sabotage operation carried out on 1 May the following year, with the connivance of a French girl whom he had just married, he blew up the power lines at the Marège dam between Neuvic and Sant-Angel, using explosives meant for and previously pilfered from the L’Aigle dam project. He was to participate in further operations, albeit that these were of limited impact due to the dearth of arms. So we dealing here with two distinct maquis groups, the Soleil and the Carlos, depicted by the author of Hasta su aniquilación as a single partisan group and the kernel of the future Libertad Battalion. “Out of this group grew the so-called Libertad Battalion under the command of Liberto Santos …” he writes. And at this point we need to reflect because, without querying the remainder of his excellent book (which is indispensable, no doubt) we have to dispute his conclusions regarding that anarchist fighting unit. In addition, allow us to query his conclusions since the characteristics of each maquisard group do not bear out Martínez de Baños’s conclusions. In the case of comandante Soleil’s unit because the Spanish presence within that French maquis could hardly be described as notable. Quite the opposite. There is scarcely any data about fighters of that nationality within its ranks. And let us not forget that the Libertad was made up of “Spanish anarchists”. For another thing, given the communist complexion of the unit attached to the FTP-MOI, it is unlikely that comandante Carlos’s maquis was the source of the fighters who filled the ranks of the libertarian battalion. So it seems unlikely that there were many members of the Soleil and Carlos groups in the Dordogne who might have picked up on the appeal of the Libertad Battalion from Lot-et-Garonne (or, as another theory has it, in Les Landes). Although there is one instance of that sort – José Cervera, mentioned in the section dealing with Solano’s version of the setting up of the Libertad – there is just a chance that his was not an isolated case. Whilst we cannot state that this anarchist served in any of the two French unit cited, all we can be sure of is that he was part of the maquis in Belvès, an area where there were other groups of resisters fighting the Wehrmacht troops. Given the autonomous character of the two Dordogne maquis groups and the independent insurgent actions they mounted, it is our belief that the confusion with Santos’s battalion is down to the fact that ALL these groups of resisters happened to serve on the same battle-front during the months leading up to the German surrender. Both Coustellier’s group and Ordeig’s were incorporated into the 4th FTP Regiment in 1944, under the command of the former (Soleil), with some 500 men and they finished up fighting on the Médoc front, which happened also to be where the anarchist (and the Gernika) battalions were posted as we shall see over the course of this study. But who was this León? And had he really any connection with the Libertad Battalion? If we go by the texts accompanying the “Spanish Republicans in the French Resistance” exhibition mounted by the Gironde Association of Spanish and European Retirees we find behind the nick-name León one Eliseo Martínez López (b.1912), a native of Piqueras in Guadalajara, a republican exile drafted into the GTE (Foreign Labour Teams) set up by the Vichy regime. As we know, those militarized units were divided as a means of imposing internment and virtually slave enforced labour on foreign males (between the ages of 18 and 55 finding themselves within Free France’s collaborationist zone. Thousands of exiles, most of them Spanish republicans, watched over by French officers, worked tirelessly, being required to contribute to the French economy and the German war effort; they were organized into labour teams placed around industrial sites close to towns, on major hydraulic sites or scattered through the forests and fields. Eliseo Martínez was posted to one of these – the Saint Antoine (Corrèze department in southwest France) – to do farm work. The structure of the GTEs had one shortcoming – the high numbers of workers making up each contingent, the result of the drive to recruit foreign labour. Such clustering worked in the favour of dissent on the part of those subjected to a labour regimen that was compulsory and exhausting, expediting the political and trade union reorganization of Spanish antifascists who set up resistance groups inside the GTEs. This hush-hush organizational effort would eventually turn the GTEs into support bases for the rest of the resistance and into nurseries for partisan activity. When German troops invaded the unoccupied zone previously governed by the Petain government on 11 November 1942,. A lot of these conscript labourers swelled the ranks of the military formation organized by the Spanish Communist Party (PCE) on French soil during the early months of that year: the 14th Guerrilla Corps (name after an outstanding Republican Army unit during the Spanish Civil War); there Eliseo Martínez – adopting the underground name León – was in charge of a small 6-man team in the Brive-la-Gaillarde area which would become the “regional capital of the Resistance” in the Limousin (an old metropolitan region). In March 1943 he and 8 guerrillas launched the first armed MOI unit in the Dordogne – the Lina Odena – in Tumac (Domme district); it had French members and members from other nationalities. In December 1943, at the request of the leaders of the French Communist Party (PCF), the 14th Corps joined the French communists’ partisan organization, the Francs-Tireurs et Partisans Français (FTPF or FTP). Contact between the French and the Spanish groups allowed for a fluid exchange of expertise which led to certain partisans being reassigned elsewhere. Comandante León, well versed in insurgent tactics, would be contacted by the French maquis. According to what the exhibition mentioned above says “in July 1943 in Fanlac (near Monitignac), commandant Coy contacts Eliseo Martínez (aka León) for help in bolstering the FTP officer-training school”, that school being the guerrilla training school mentioned by Martínez de Baños. The following year, the FTP and the Spanish communist guerrilla units joined the French Forces of the Interior (FFI) which had been set up to unite all of the resistance in France. Even so, units from the 14th Guerrilla Corps retained their own organizational and operational dynamics (division, brigade, battalion and detachment – a legacy from the Republican Army) and continued to operate as the armed wing of the UNE, the political body of the exiled Spanish communists. This autonomous aspect of the Spanish communists would reach its peak in May 1944 when its units were recognized under the designation of the Agrupación de Guerrilleros Españoles (AGE). By the summer of 1944, they numbered around 10,000 members organized into thirty brigades in the departments across the south of France. That figure does not include those Spaniards who formed autonomous groups, such as the Libertad and L’Aigle libertarian maquis groups, the Basque Gernika group and other units of varying persuasions. At that point the French communist groups embarked upon a new military strategy that prioritized front attacks on the enemy over previous harassment and harrying operations . 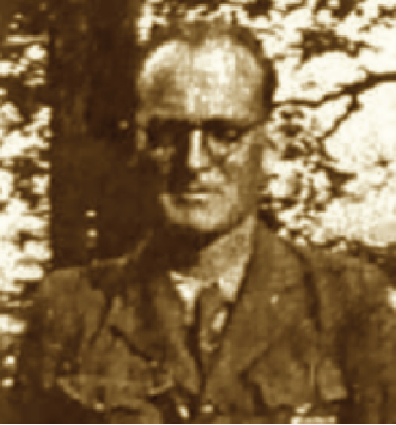 Eliseo Martínez abided by the new directions by sabotaging the Bourdon tunnel (June 1944) and taking on a German unit in Castelnaud-Feyrac (Dordogne) around the same time. Up until the war ended, he carried on orchestrating raids and playing a leading part in setting up other maquis groups. Harking back to the text … “initially the former (the Libertad) was made up of the Spaniards and French in the Domme (Dordogne) forest under the command of León …” and immediately one problem leaps out. Eliseo Martínez, as we know, was in the Domme only up until the summer of 1943, as he switched that August to another part of the department (to Montignac) to perform his new duties as a trainer at the officer training school. Given that we know that the Libertad Battalion was formed later, in the summer of 1944, we now find that León had left that area a year previously. Too much time had passed for the forest in the Dordogne to be cited as the libertarian group’s birthplace. Besides, Martínez de Baños mentioned that it was made up of Spaniards and French, when in actual fact only the former (Spanish anarchists) made up Santos’s battalion. Also the huge distance between the geographical areas is yet another reason for us to doubt the claim that the guerrilla leader trained combatants from the libertarian battalion. And, like the Carlos group, the profile of the León group – an FTP-MOI communist military unit, of mixed composition and with a clear majority of French fighters – suggests that that group likewise could not have been the “source” from which a battalion of Spanish anarchists was drawn and that, even if there was some migration across to the libertarian formation, it must have been negligible. A single source, Wilebaldo Solano, mentions resisters who enlisted with the Libertad Battalion as having come from the Tarn-et-Garonne department in the south of France; during the 1940s the department was part of the now superseded Midi-Pyrénées region. 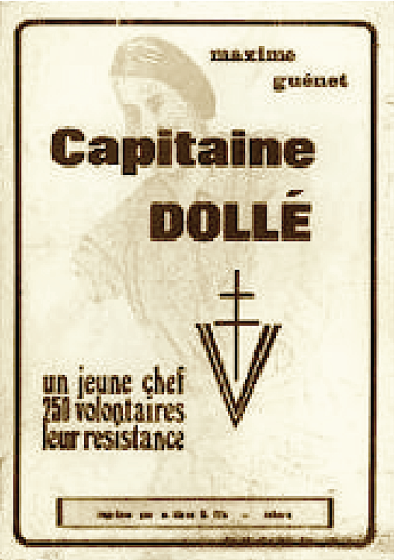 And the reference is a generic one, with no mention of the numbers of new recruits, just the name of a town – Montauban, capital and prefecture – as their place of origin mentioning them as another casualty of the subterranean war being waged by the PCE in recently liberated territory against organizations and activists who did not back its political strategy. The vindictiveness shown towards POUM members still stood in the minds of the Spanish communist leaders and Joan Farré Gassó, a significant figure in that party in Lérida and a member of its second Executive Committee was once again a target of the stalinist purges. 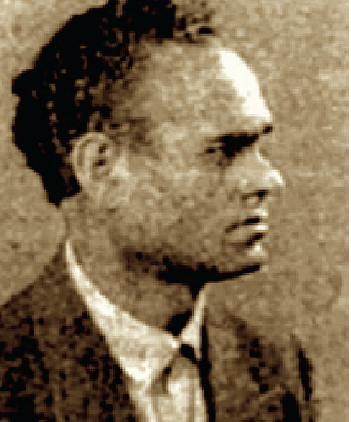 Farré Gassó, indicted (as was Wilebaldo Solano in the second trial mounted against the POUM during the Spanish Civil War, a trial never actually heard dur to Barcelona’s falling into Francoist hands) had managed to get across the French border and survived imprisonment by the Vichy collaborationist courts but was not able to escape the wrath of the communist-minded resistance groups which had seized control of large swathes of French soil. 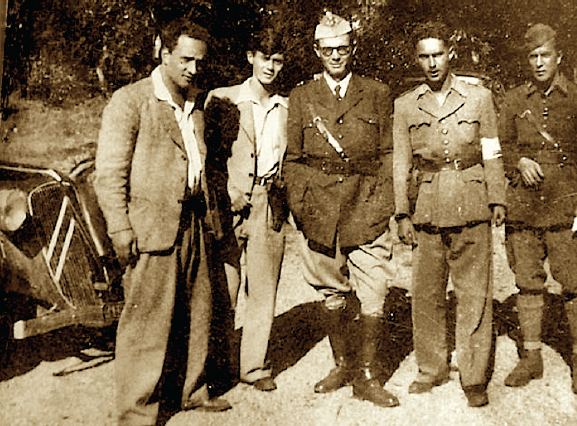 The arbitrary nature of Farré Gassó’s execution – carried out by communist partisans – as he was seeking refuge in a small town in French Catalonia is one example of the reprisals that the wayward could expect from the leaders of the Une, AGE , PCE and the latter’s French sister party. We can only suppose, however, that more Spanish fighters might have defected from those units – Montauban and district was a hotbed of maquis activity – or applied for a transfer to the recently created Spanish libertarians’ unit. Septfonds, a town in what was once the Midi-Pyrénées region, sits in the Tarn-et-Garonne department, in the Montauban district. The graveyard there holds the remains of 81 Spaniards who perished in the nearby internment camps where many anti-Francoist exiles were penned. The Third Republic’s Vichy government – which collaborated with Nazi rule – opened special internment centres there to house undesirable aliens. This, 1941 saw Allied officers captured in France beginning to be held there and in 1942 inmates of Jewish extraction held there were deported – after being handed over to the Germans – to the Third Reich’s death camps. 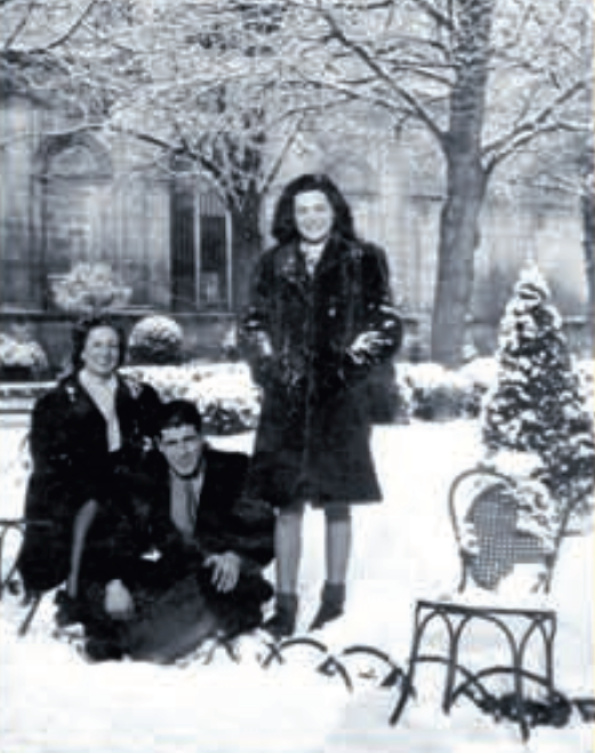 Long before that, from March 1939 onwards, Spanish refugees were interned in Septfonds, as many as 15,000 of them. There were two camps: Camp Lalande subjected them to special disinfection measures before they were moved on to the other camp, Camp Judes, a camp where watch towers looked down on a double perimeter of barbed wire. Hundreds of these prisoners would be relocated to the Fumel metalworking plant where there was a strong libertarian group, as mentioned earlier. Unfortunately, however, the fame of a few units overshadows the rest and the presence of groups of anarchist resisters elsewhere in France has been overlooked: this is the case with the Massif Central region, a sheer-sided plateau in the centre-south of France (made up essentially of plateaux and mountains) with a tough climate… ideal for maquis activity. 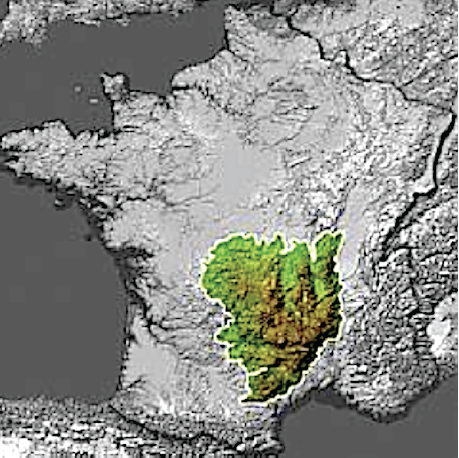 The Cantal department (called after the mountains of the same name) is one of four departments that make up the Auvergne a region occupied mostly by the Massif Central. Historically, it is a thinly populated area, due to its complicated terrain which, as we have seen, is ideal for guerrilla warfare. But it is not our belief that the libertarian battalion, contrary to E Sarboni’s claims, ever roamed that area, as the route taken by comandante Santos’s unit carried it away from the region as it headed westwards towards the Atlantic shores (the Médoc front). It is more than likely that this confusion is down to there having been another group of resisters in that area; the anarchist L’Aigle dam anarchist group, a guerrilla unit which, like the Libertad, was made up of anarcho-syndicalists and was an autonomous unit outside of the stalinist Unión Nacional umbrella. 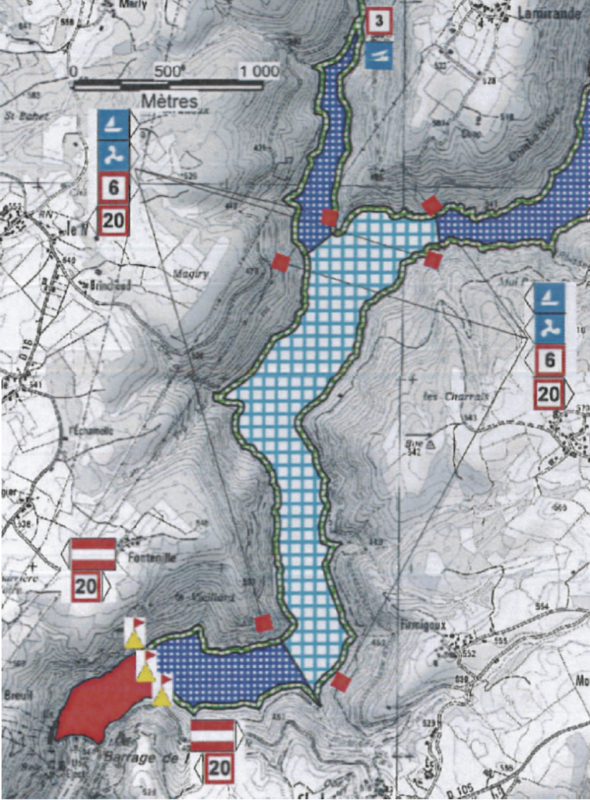 Map: The L’Aigle reservoir today. The dam sits in the lower left corner of this picture. Like the Fumel metalworking plant where the workforce drew in conscript Spanish exiles, other sectors of production too used such cheap labour within which there was a strong libertarian presence. This is dealt with in 1939-1975: la CNT durante el franquismo where we read that “… many of the exiled anarchists wound up in the Labour Companies and March Battalions where they toiled under a harsh disciplinary regime. 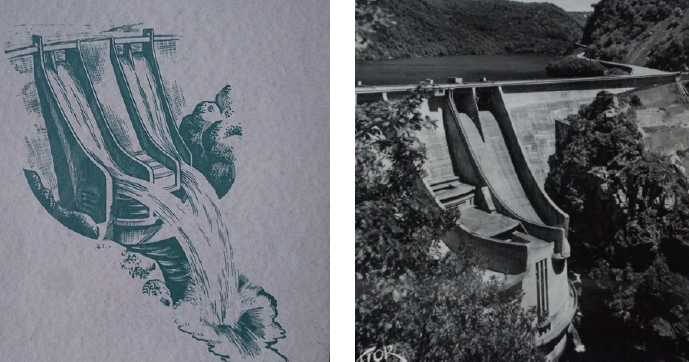 Then along came the weirs, dams and great hydraulic projects which put the efforts of the exiles to full use”, in that workers were in short supply for such mammoth projects. In November 1941 – at great risk, given the Gestapo presence – the group set about forming the Organizing Commission of the Spanish Libertarian Movement in France, which brought together members of all three of the Spanish anarcho-syndicalist organizations (the CNT, the FAI and the FIJL). With the setting up of this body a reorganizational process began that spread across the free zone and Occupied France and culminated in March 1944 in the Muret plenum (shortly before the Allied landings on the Normandy beaches), at which the whole of CNT in France was up and running in France. “… the Spaniards making up the Foreign Labour Companies (GTEs) started to band together with one another along ideological lines on the work sites. Such groups, spontaneously organized within the work sites confined themselves during 1940, 1941 and virtually all of 1942 to helping to conceal countrymen fleeing the German occupation zone. 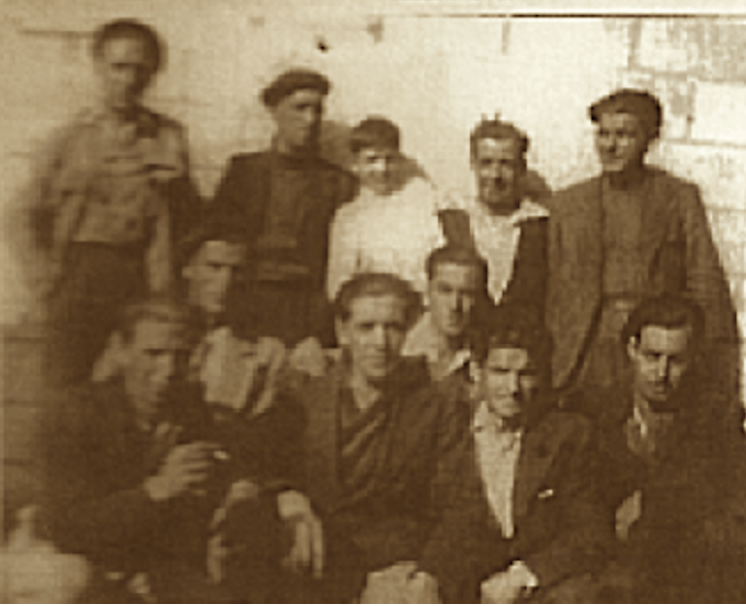 At that point the work of the fighting group led by José Germán González – a CNT member from the Amposta comarca of Tarragona back in Spain – had grown into an armed battalion some 150-200 resisters strong since it was now looking past the hiding and protecting of fugitives and was also mounting indep0endent sabotage operations against communications lines and tunnels and also taking part in joint operations with the French maquis. But the members of the UNE stuck to their practice of volunteer recruitment, ordered … “120 comrades from Laroquebrou (Cantal), where there was a very large CNT Local Federation to sign up. This ploy was effectively thwarted thanks to the organization’s moves.” A similar instance arose in Limoges (Haute Vienne department) when the communists got the French military to issue an order calling upon all Spaniards – inside or outside of the Union Nacional – to report to barracks under the control of that organization. In the end, that order was rescinded. The disappearance of these two UGT militants in the murky circumstances described gave rise to “serious suppositions regarding Unión Nacional activities … and in the L’Aigle dame project it there was universal disgust among every section of the Spanish exile community. In order to alert them to the fact that we could imagine who was responsible for it, at a meeting with the leading communists” a delegation from the anarcho-syndicalists was blunt about it. “We take it for granted that the disappearance of Trujillo and Córdoba is part of your unity plans. We have our suspicions as to who as behind it, but we warn you that should a CNT member have a hair on his head touched, you will receive a proper and swift answer.” As we have seen, the response was blunt. Plainly the high proportion of CNT members gathered together into its ranks – hundreds of the workers on the dam site – afforded some cohesion to the group when faced with threats (from the communist groups or from the German occupation troops). And the autonomy which this band of resisters with their libertarian ideology and practice shows us that it is highly unlikely that any of its members joined the Libertad Battalion with is similar features. Furthermore, in order to stand up to pressures brought to bear by the UNE and the AGE, there was no need for them to join any other anarchist unit – such a comandante Santos’s unit – since they already were in one. And as to the other groups mentioned that came under Unión Nacional bullying, the umbrella provided by the CNT and by the L’Aigle dam maquis was enough to curb the communists’ intentions, so their members had no need to switch to another unit. The venom shown by the PCE in France towards the libertarian movement which refused to defer to its demands has lingered on through the memoirs of the Spanish communist leaders who survived the war. 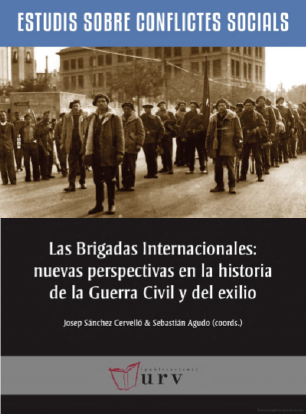 Thus, as against the views of the CNT’s Berruezo – eye witness to and participant in the competition between anarchists and communists – we have the opinion of the communist Sixto Agudo as set out in the book La Brigadas internacionales: nuevas perspectivas en la historia de la Guerra Civil y del exilio. As a member as he was then of the PCE Central Committee, plainly, this veteran antifascist was pleading his party’s case and overlooking the fact that in the area around the L’Aigle dam the siege strategy applied by its groups was rejected and he asserts instead that in Cantal there was alleged collaboration with the UNE by the majority of anarchists who were working on the dam construction site. His view is a far cry from that of Berruezo, the latter’s being more believable in that he was eye witness to the things he recounts and had been put under pressure from stalinist units in Cantal. Besides, we know that the anarchist L’Aigle dam maquis was one of the mainstays of the reconstruction of the CNT in exile, so it could scarcely have agreed with directives coming from the PCE in France. Although we have been focusing thus far on tracking down anarchist partisans at odds with the PCE agrupaciones operating in French departments, it ought to be pointed out that not all CNT members shunned membership of the Unión Nacional and the Agrupación de Guerrilleros Españoles. We quoted one telling example in the chapter devoted to the performance of the 24th Division of the AGE and the liberation of Bordeaux – José Manuel Montorio Chaval, an anti-Francoist fighter who held dual membership and who exercised his guerrilla talents from with the communist structures. But he was not the only one. They made that decision because they took a different view of the worldwide political situation from the rest of the libertarian movement. Much of the latter was prioritizing the reorganization of the libertarian ranks in France and, whilst remaining independent of them, supporting the French resistance once the latter became a mass phenomenon, in the hope that, after the war, France and the other countries fighting Nazi Germany might help them unseat Franco, Hitler’s erstwhile ally. Other groups, critical of this approach, lobbied for the immediate launch of a fight within the Iberian Peninsula, through the establishment of guerrilla groupings harrying the dictator’s army and law-and-order forces, like the PCE was insisting (in conformity with directive emanating from the Soviet Union). Photo: The cover of the book of which Josep Sanchez Cervelló and Sebastián Aguda Blanco were co-ordinating editors (Publicaciones URV – Universidad Rovira i Virgili). Many anarchists – whether mobilized in like-minded groups or not – also participated in the abortive Operación Reconquista (1944) planned by the Spanish communist leadership, a plan to invade Spain through the Arán valley in 1944. The proximity of the border encouraged the ambitions of the guerrillas operating in the mountainous departments close to the Pyrenees, from where they laid their preparations to mount a lightning attack in which they would capture villages to be added to the liberated territory and a provisional government was supposed to be set up to spearhead a popular uprising in the interior. 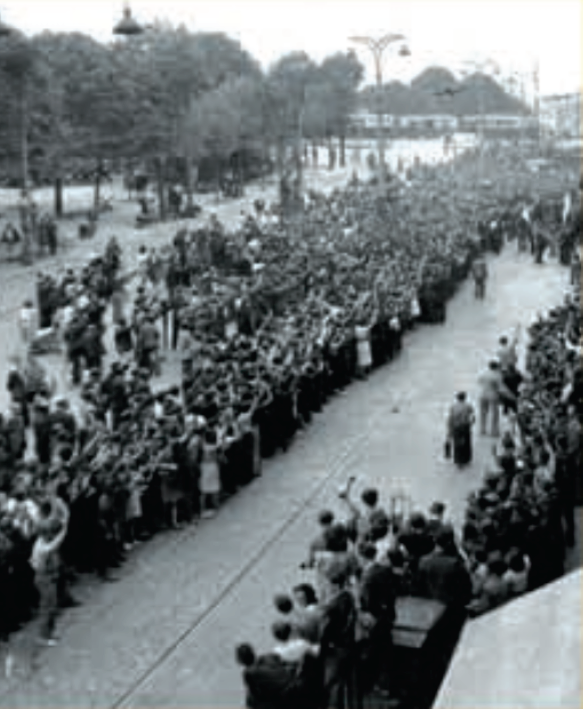 A product of the euphoria of the day, when the defeat of the Nazis looked imminent, the wrong-headed analysis made of the situation within Spain – where the population was living under totalitarian terror – resulted in a resounding failure which forced a review of the UNE’s strategy for toppling Franco. According to Jean Ortiz, writing in Sobre la gesta de los guerrilleros espanoles en Francia, the UNE was trying to rally “… a greatly divided exile community in which the wounds from the [civil] war were still open. The ‘all for one’ proposal managed to win over some socialists and libertarians and plain republicans, but not the republican organizations as such…. It drew little known leaders such as its chairman, Dr Aguasca from Esquerra Republicana, an anarchist dissident, Cubell, and a Catalan communist from the PSUC, Olivo. The minorities from the anarcho-syndicalist CNT and from the PSOE socialists who sided with the PCE did so by breaking ranks with their own organizations which were hostile to unity with the communists and more receptive to the British Foreign Office’s and United States Department of State’s “wait-and-see” policy. However, in some departments (Ariège, Gers, Basses Pyrenees) libertarians constituted a ‘significant’ fraction of the Union Nacional, albeit that they had not bought fully into it. It is worth stressing that the CNT’s protests about being under-represented on the editorial boards of the UNE’s press mouthpiece were made even though the CNT Agrupación was publishing and distributing its own publication within the PCE’s guerrilla agrupación: this was the review Solidaridad Obrera which had as its motto Durruti’s dictum: We renounce everything, save victory. Having come to the end of our – far from exhaustive – quest for the origins of the Libertad Battalion (aka Santos Battalion or CNT Battalion or FAI Battalion) we can state that the is unanimity regarding the ideological make-up of the unit: it was predominantly anarchist and – on a lesser scale – included socialists, republicans and a few POUM members (such as Wilebaldo Solano). There is also agreement on when the unit was created; in the summer of 1944, when the Liberation of France erupted following the Allied landings on France’s Atlantic shores. Differences crop up when it comes to identifying the origins of the foundation group. 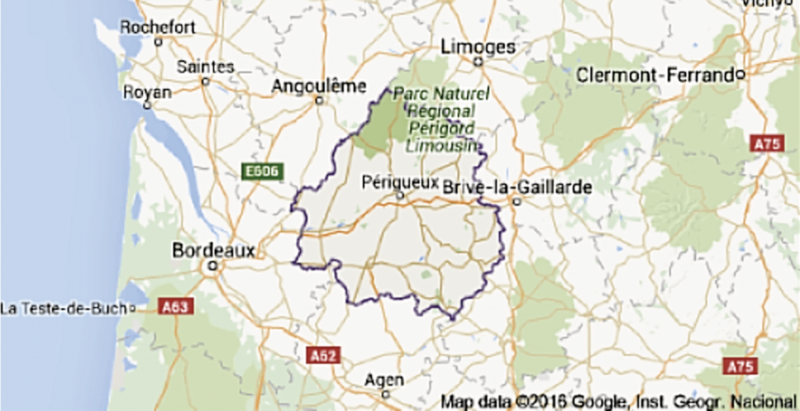 According to Solano, the guerrilla unit was organized in Villeneuve-sur-Lot (Lot-et-Garonne department) on the basis of fighters arriving in dribs and drabs from elsewhere in that department (such as Fumel) and adjacent areas (like Montauban, capital and prefecture of the Tarn-et-Garonne department. Buscaglia, a contributor to the Foro de Historia Militar el Gran Capitan, takes issue with that and argues that the initial core of the Libertad Battalion memberships was in the Les Landes department “after the Liberation, Spanish republicans and anarchists exiled in the Les Landes department were banding together around a pre-existing anarchist group of anarchist persuasions. They formed the so-called Libertad Battalion, made up mostly of exiles who had been in the area since 1939. A lot of them had plenty of military experience built up since 1936.” To these were added libertarian fighters enlisted in the 31st Brigade (led by Eduardo Casado Barbas) attached to the 24th AGE Division (under Mateo Blázquez, comandante Marta), who quit that unit because they were unhappy with the communist influence within the Brigade. As for the Massif Central region, far removed from the Gironde department (the end of the line for the libertarian battalion and Ordoki’s Basque Battalion), but, according to some authors, linked to the Libertad Battalion, there seems to be every indication that these authors are mixing up comandante Santos’s unit with the L’Aigle dam unit on account of the mostly anarchist make-up of the two units. And we think that other claims regarding partisan groups (the Soleil, the Carlos and the León) are also mistaken and we have discounted them because we have not been able to establish connections to the anarchist group with which we are concerned. So, to date we have two persuasive versions – which may complement one another – regarding the inception of the anarchist fighting unit; plus a few less believable versions. Yet another puzzle to be added to those around the guerrilla group led by Santos, a slippery maquis that has left little trace of its passage through history. So much so that the very figure of its commander remains a mystery, as do the men of whom he was in charge. Because they too evaporated come the end of the war, with only a few of them ever mentioned (less than a dozen out of the 300 or more enrolled in it) and little has been written about their time with the battalion. That being how things stand, we are closing the FIRST INSTALMENT of this research and collation report on two sui generis guerrilla groups who popped up during the last fighting of the Second World War in France. The existence of one of them – the Basque battalion – was discovered thanks to the perseverance of their countrymen who unearthed its record with pride. That of the other – the anarchist battalion – remains virtually unknown, even to its co-religionists. Recounting its history and rescuing them from oblivion is the guiding light behind this modest investigation which continues in the next instalment: Bound for Oblivion.